A pretty good B-Western featuring John Wayne, very early in his starring career, The New Frontier (1935) breaks no new ground but is well made for its budget level. Indeed, it's fairly lavish by Republic Pictures' standards, the studio then just getting started itself, having been founded earlier that year when Consolidated Film Laboratories president Herbert J. Yates merged six Poverty Row studios into one. Nasal-voiced character actor Al Bridge makes the strongest impressive, in a showy good-bad guy role quite unlike his later screwball comedy parts of the 1940s. A Paramount-owned movie licensed to Olive Films, The New Frontier looks absolutely glorious in high-def. Die-hard fans of these kinds of B-Westerns for years suffered through positively dire public domain offerings on VHS and, later, DVD. Indeed, boxed sets of the ultra-cheap John Wayne Westerns made just prior to The New Frontier (e.g., The Star Packer, Randy Rides Alone, The Man from Utah) have been widely available for years, always in terrible, unwatchable video transfers. Now, cup-half-empty consumers have been complaining loudly about these Olive releases, and what they perceive as overly high SRPs for movies often running less than an hour, arguing they'd be more attractive if packaged with, say, three movies on a single disc. But I contend that the pristine quality of these transfers make them well worth the price and, besides, online retailers such as Import CDs have long been selling them at a 50% (or more) discount, so the hit to one's wallet isn't quite as bad as one might imagine. Milt Dawson (Sam Flint) and his son, John (John Wayne), are trail herders in 1889. A Cherokee Strip land rush reminds Milt that the land will soon be completely tamed rendering his profession obsolete, and so he encourages John to think about settling down. John, however, isn't interested in homesteading and reminds his father about their contractual obligations to other homesteaders. John leaves to lead the new wagon train, while Milt is drawn into a dispute between peaceful settlers led by Parson Shaw (Allan Cavan) and Tom Lewis (Murdock MacQuarrie), and nefarious saloon proprietor Ace Holmes (Warner Richmond), whose business interests threaten the town with round-the-clock violence and moral corruption. Deliberately unarmed, Milt confronts Ace at his saloon, but is ruthlessly shot in the back and killed. Meanwhile, on the trail, John's party is threatened by desperate, starving hombres led by outlaw Kit (Al Bridge). When Kit realizes John is their leader he backs down, and John diplomatically obliges the raiders with 300 pounds worth of food. Arriving safely in town John learns of his father's murder and agrees to become sheriff. Partly this was achieved through the use, judiciously here, of stock footage. Some but not all of the land rush footage is lifted from a silent Ken Maynard Western, The Red Raiders (1927), while the genuinely spectacular climax, in which an entire town is set ablaze, is also at least partly stock scenes, though possibly from some other film. Publicity for The New Frontier claimed some 60 buildings near the Trem Carr ranch in Newhall, California were set ablaze, but it's pretty obvious that only one large saloon set and some adjacent structures were actually burned for the picture. Nonetheless, even that footage is pretty impressive. The one good thing about Wayne's cheap Lone Star films was that they afforded him the chance to sharpen his acting skills and develop the earliest vestiges of his eventual iconic screen persona. He's still pretty green in The New Frontier but he's also a lot more relaxed and less fidgety than he was in his earliest starring films such (e.g., 1930's The Big Trail). Nevertheless, the supporting cast makes a bigger impression. Warner Richmond is a terrific, unblinking villain while Muriel Evans, who alternated between prairie flower-ingénue roles in B-Westerns and as Charley Chase's wife or girlfriend in Chase's long series of two-reel comedies, is more naturalistic. But Al Bridge makes the biggest impression as pragmatic desperado Kit. Bridge was usually cast as heartless (but often ineffectual) villains in B-Westerns until 1940, when screwball comedy writer-director Preston Sturges cast him against type in his directorial debut, the screwball comedy Christmas in July. Bridge instantly became part of Sturges's unofficial stock company, appearing in all of his Hollywood films, in roles that brought Bridge a lot more work in comedies generally. In The New Frontier Bridge makes the most of a clichéd but appealing part, milking it for all it's worth. For decades movies from Republic Pictures almost invariably looked mediocre at best on television and home video, to the point where I had assumed that the original camera negatives must had long ago been junked. But The New Frontier looks practically perfect. The black-and-white, 1.37:1 image is positively pristine, with only minor imperfections inherent to the original film elements. Detail, blacks, and contrast are all very impressive. The Region A disc has decent audio, English only with no subtitle options, and No Extra Features. 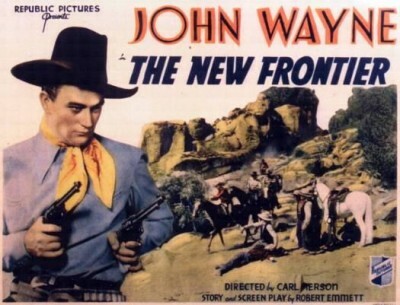 Somewhat primitive and obvious story-wise but fairly effective considering, The New Frontier is interesting as an early starring film for both John Wayne and Republic Pictures. The transfer looks great and the Blu-ray comes Highly Recommended.